It’s come to our attention that despite having some male-sounding names such as Comet, Donner and Blitzen, some of Santa’s flying caribou, as depicted in most Christmas lore, may be inaccurately christened. While both genders can grow antlers, males actually shed theirs during the winter months, and yet most popular depictions of Santa’s sleigh include antler-sporting reindeer. Perhaps it’s the Christmas magic that enables North Pole caribou to maintain their impressive crowns, but with the holiday only days away, we thought it was time to see what was behind the names of some of Santa’s most popular fliers. According to Holidappy, a site run by holiday enthusiasts, all eight reindeer have very unique personality traits. As we got to know them, we were surprised to discover how adept they’d be at helping insurers tackle some of the issues we’ve discussed in our blog this year. Dasher, for instance, is a multi-faceted reindeer. 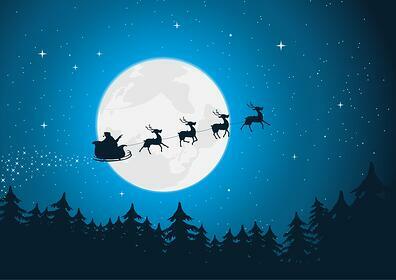 Well-known as the fastest of Santa’s sleigh pullers, he excels at the 800-yard dash and making purses. Yes, making purses. We think this makes him not only one of the most unique of the team, but also the most driven, always embracing new challenges. We see him easily sitting at the helm of an insurance organization, leading the cheer toward internal cultural change in the digitally-driven 21st century. Dancer, as his name implies, is nimble and fleet of foot. He’s the first to start a tango or suggest a festive square-dance. Where we see him taking place in a modern-day insurance organization isn’t clear, but we’re sure he’d be a fun guy to have around, and with his dual-love of pomp and ceremony, he’d probably fit right in. Prancer is quite proud of his appearance, but he isn’t vain or cocky. In fact, his greatest interest is the welfare of his team. Because he always looks his best and has a strong interest in seeing the group excel, we see him forging new connections and establishing strong partnerships that could help his insurance buddies better master the digital reality. Vixen is pure magic. His ability to make things disappear often lands him in hot water with the other reindeer when he tricks them out of their candy canes, but wouldn’t he be great to have around for those eventual core systems upgrades every insurer must face? Imagine him waving a hoof to easily make an integration problem vanish. Comet is awe-inspiring for his laid-back and trustworthy demeanor. He’s the one Santa relies on, when he heads out to meet and greet children around the world, for his ability to exude confidence and good will. We see him as an insurance ambassador, improving customer acquisition and retention rates by standing as a sentinel for the digital rights of thousands of Americans. Donner and Blitzen could easily work together to improve the speed and agility of insurance distribution. Their names come from the German words for thunder and lightning respectively. We see them as two of the most necessary components of a top-grade digital distribution strategy. Donner, with his booming voice, easily propels insurance interactions into the 21st century with streamlined multi-channel engagement, while Blitzen speeds insurers into new markets and greater wallet share by opening the door to a vast universal market network of products that carriers can bundle to meet more of the needs of their customers, without taking on additional risk. It’s proof that no matter what you call them, Santa’s team of flying reindeer would make great additions to any carrier’s team, easily pulling them into the 21st century of digitally-distributed insurance. Learn more about 21st-centuray digital distribution by downloading our thought leadership piece, . iKlein Wassink, Bernhard J., Kaenan Hertz, and Melanie Henderson. The Why and How of Simplified Customer Communications. Rep. n.p. : n.p., n.d. Web. 12 May 2016 <http://www.ey.com/Publication/vwLUAssets/ey-the-why-and-how-of-simplified-customer-communications/$FILE/ey-the-why-and-how-of-simplified-customer-communications.pdf>.